When it rains, it pours, goes the adage. During the last few months, several nature guides have been added to my bookshelves. One is Nature Anatomy, by Julia Rothman, the subject of this post. Two are large format books won at a school auction: Maps, by Aleksandra Mizielinska and Daniel Mizielinski; Animalium curated by Katie Scott and Jenny Broom. Recently I met in person Tristan Donovan, author of Feral Cities, and talked about the book and the animals therein. Read my review of Feral Cities and interview with Tristan. 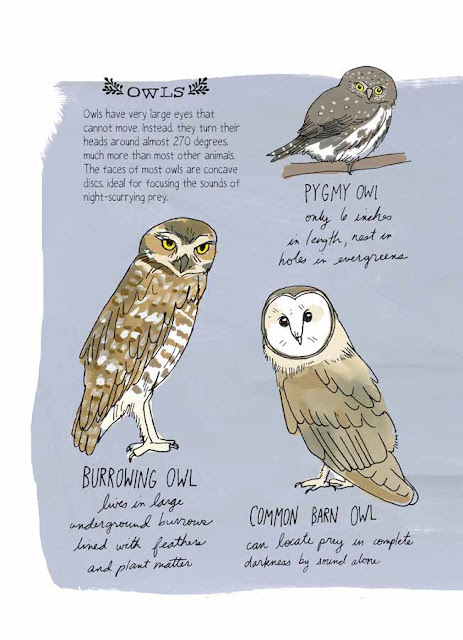 On July 5th, the New York Times published, Wild in the Streets, an hour-by-hour guide to the wildlife one could see in New York City written by Dave Taft and illustrated by Matt McCann. I had seen Nature Anatomy in several places including on Brainpickings and How We Montessori and was wowed by the illustration-heavy storytelling about nature. The book successfully engages the reader and communicates the fine-grain elements and large-scale processes of the natural world with gouache paintings. 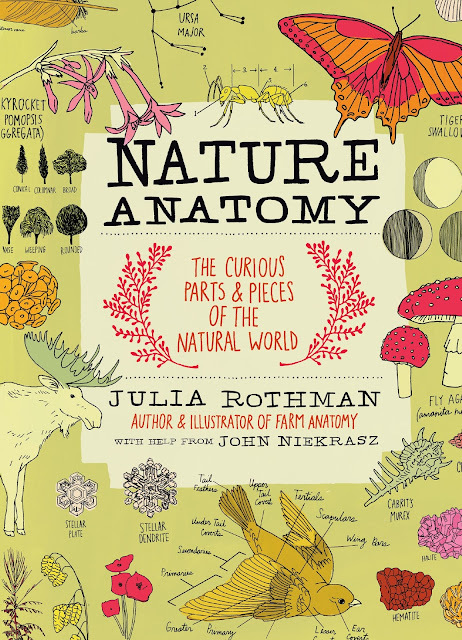 Nature Anatomy is beautifully drawn and diagrammed, and if you are curious about the typeface, it's based on Julia Rothman's handwriting. The book's origin story also resonated with me. In her introduction to the guide, Julia Rothman tells readers that she lives in Park Slope, Brooklyn, and spends time in the park everyday. She writes, "I cherish being surrounded by greenery for just a small period of time each day. It keeps me sane to be able to smell grass after being squished likes a sardine in a subway car. I really look around the park wanting to know more. What is that tree with the beautiful leaves called? When will those flowers I saw last year show up again? Are those really bats flitting above our heads? How funny to see so many dragonflies attached, making love!" What do you see on your daily walks?! Nature Anatomy is organized into seven chapters. Each chapter describes a particular aspect of the natural world. Chapter 1 is about the inner workings of the Earth -- its movement around the sun, the rock cycle, landforms, mountains, landscape types, and field to forest succession [note: the end product of the succession is not necessarily a climax community as disturbance plays a role in forest composition over time]. While the book has a North American plant and animal bias, the processes described are fairly universal. Rainbows and sunsets follow a similar script everywhere. Chapter 1 ends with tips on "loose landscape painting." Excerpted from Nature Anatomy (c) 2015 by Jula Rothman. Used with permission of Storey Publishing. 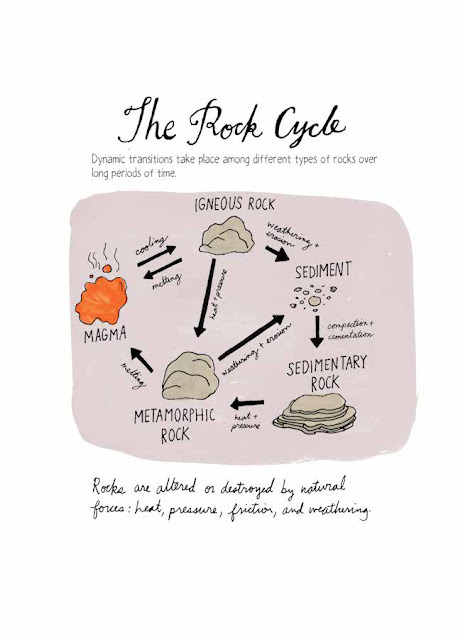 One of my favorite diagrams in this chapter is the one illustrating the rock cycle on page 18. It reminded me that sedimentary or igneous rocks can be directly transformed into metamorphic rocks via heat and pressure. To transform metamorphic rock to either sedimentary of igneous is a multi-step process. Chapter 2 directs the viewer to look up. The hows and whys of atmospheric layers, weather, the water cycle, storms, snowflake morphology, rainbows, sunsets, moon phases and constellations are contained within this chapter. 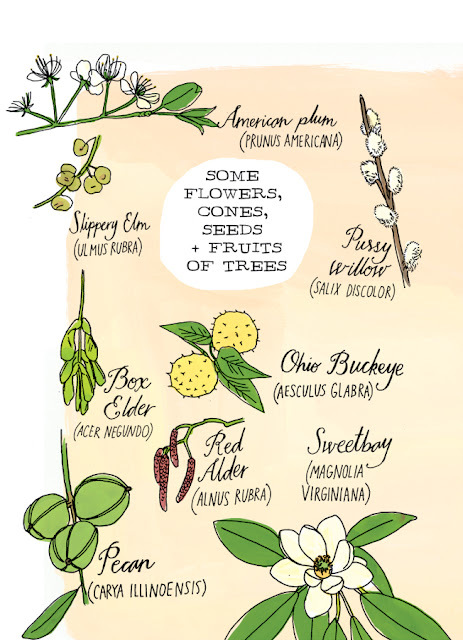 Image: Some flowers, cones, seeds + fruits of trees. Chapter 3 is all about getting up close to flowers -- their pistils and stamens -- and [insects] such as bees, butterflies, spiders, and ants. Also featured in this chapter are sedges, rushes, and grasses. I recently acquired a macro lens for my phone so am keen to photograph the pistils and stamens of flowers as well bark details. The drawings of butterflies and moths would make nice posters for a child's bedroom or classroom. Chapter 4 is a primer for taking a walk in the woods. You will learn about the anatomy of a tree and its trunk and to use a leaf key. Julia Rothman gets up close in this chapter, too, to bark. You will see the things a tree bears -- flowers, cones, seeds, and fruits. Ferns, lichens, mosses, and mushrooms are featured too. Look for the how-to make prints from leaves and how to saute bolete mushrooms. Have you heard of waterbears? They are micro-animals associated with mosses and lichens. Chapter 5 moves into the faunal realm. Opossums, raccoons, chipmunks, badgers, bats, tree and ground squirrels, grizzly and black bars, snakes, lizards, wild cats and dogs, antlered and horned animals, even the lyme bacteria cycle. Aquatic (ex: river otter) and marine (ex: harbor seal) mammals as well as salamanders and turtles are also included in this chapter. Chapter 6 is all about birds. Their anatomy kicks of the chapter followed by feather types, birdcalls, nesting structures, eggs, beaks, and bird behavior. The chapter ends with a look at bird of prey, owls, big birds, and water birds. I wouldn't mind hanging a poster of A Bevy of Birds in my apartment. Two birds of prey familiar to New Yorkers are drawn on page 180 -- the red-tailed hawk and the peregrine falcon. Chapter 7 takes us to the water. You will learn about different types of waterbodies, how a pond functions, the life cycle of a salmon and a frog, the differences between a frog and a toad (the presence/absence of teeth is one of them), examples of freshwater and saltwater fish, jellyfish, seashell morphology, and (eating) seaweed. The geoduck remains unattractive to me, even drawn by Julia Rothman! Nature Anatomy is a great reference book. I would give it to the nature generalist in your life. I would recommend the guidebook for families with young children and for budding naturalists. If your child has a collection of crystals, rocks, shells, insects and bugs, sticks, leaves, and acorns and cones or talks about that time he saw a jellyfish on the beach or the red-tailed hawk eating a rat in the park or watching the caterpillars become butterflies in his classroom, this would be a great gift. The book would fit well into any classroom though it would be a particularly strong fit with Montessori settings. The only drawback of the book is its lack of an index. I'm sure it's not an oversight; you are implicitly encouraged to read the entire book the first time and subsequently to flip through the chapters until you get to the bit of information you need. It's pleasant to do so. I received a copy of Nature Anatomy courtesy of Storey Publishing. All images excerpted from Nature Anatomy (c) 2015 by Jula Rothman. Used with permission of Storey Publishing. Thank you.